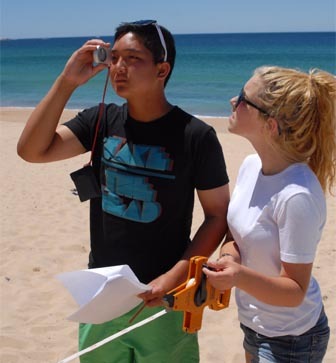 Students will investigate coastal processes by measuring and studying elements of a natural/re-established sand dune, such as size & shape, vegetation type & cover and wind speed. Identification of landforms and examination of land use in the surrounding areas will be undertaken using aerial photographs or cadastral maps. Historical photographs will be used to examine the effects of human development and storm erosion processes on the sand dunes. Detailed investigation of past and present management strategies will also be undertaken. Students will examine maps and satellite photographs to investigate local and regional land use and the impacts associated with these uses. Water pollution and management will be investigated by conducting a number of tests, such as turbidity and water pH, to analyse the health of the creeks. Human impacts on bush land will be investigated and land management strategies such as hazard reduction burning will be evaluated in relation to environmental conditions. Students will investigate the origins and changes to the Mt Keira rainforest over time before investigating the biopheric and lithospheric characteristics that allow rainforests to grow and survive. Students will learn how to use a variety of field equipment to measure such components as soil pH and texture, soil moisture, slope aspect and foliage cover. The key focus of the day is of the Mt Keira Scout Camp and it’s management practices. This unique rainforest site offers a practical understanding of how humans interact and manage the natural world. Several management practices are identified and their impact on sustainability examined. The stakeholders of the site are also discussed. To compliment the day students will conduct a leaf litter animal search to learn about the biodiversity of fauna that live within a rainforest environment and the important role they play in the cycling of nutrients. The program involves interpreting a variety of secondary data and developing map reading skills. We encourage you to contact us with any queries or comments! We endeavor to reply to all email enquiries within 48 business hours.